Chef Bart Hosmer grew up with California farmers’ markets and the kitchen as his playgrounds. Moved by the seasonal bounty of the San Francisco Bay Area and three culinary tours of Italy, Hosmer strives to complement old world techniques with modern flavors. He looks forward to sharing classic, innovative and approachable recipes that you can try out with your own Forno Bravo oven. As opening executive chef at Parcel 104 in Santa Clara, California, Chef Hosmer received critical acclaim for his seasonally inspired dishes. Other culinary experiences include Terra in St. Helena, California; Lark Creek Inn in Larkspur, California; and the Flying Fish Café at Walt Disney’s Boardwalk in Orlando, Florida. International chef stints include China, Japan and Puerto Rico. 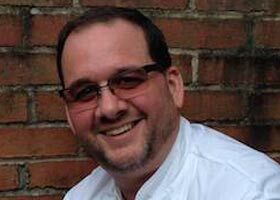 Chef Hosmer currently serves as Marriott’s senior director of culinary for the Americas. He lives in Potomac with his wife and two teenaged children, who serve as his official pizza taste testers.